Peel onion and chop into small pieces. Cut away the leaves of the cauliflower and some of the stem, keeping the core part. Coarsely chop cauliflower into pieces. Turn Instant Pot or pressure cooker to SAUTE and melt the butter; then add the onion and cook 2-3 minutes. Then add the chopped cauliflower, chicken stock, garlic powder, and salt. Lock the lid, use the MANUAL setting and cook on HIGH PRESSURE for 5 minutes. Quick release the pressure. Check to make sure the cauliflower is very tender; then turn the Instant Pot to KEEP WARM (use simmer or low for other pressure cookers.) Use an immersion blender, blender, or food processor to puree the soup. (I highly recommend using an immersion blender to puree the soup in the pressure cooker if you have one. Be very careful with the hot liquid if you remove it to a blender or food processor to puree.) Check the thickness of the soup and add more stock if you want it thinner or simmer a little to reduce if it seems too thin. Prepare ingredients as described above, but use 3 1/2 cups chicken stock for stovetop version. Use a heavy dutch-oven type pan that will hold all the ingredients. Heat butter or oil in the dutch oven, add the onion, cook 2-3 minutes. Then add the chopped cauliflower, chicken stock, garlic powder, and salt. Bring to a boil, then turn heat to medium-low and simmer until the cauliflower is very soft, probably 20-30 minutes. Puree soup as above, and check the amount of liquid. If it’s too thick add a little more stock and if it seems thin, cook a few minutes more to evaporate some of the liquid. Turn heat to low, add the grated cheese and cream cheese cubes and let them melt, then stir to combine. Add the half and half, heat through, and season with salt and fresh-ground black pepper. (Taste before you add more salt.) 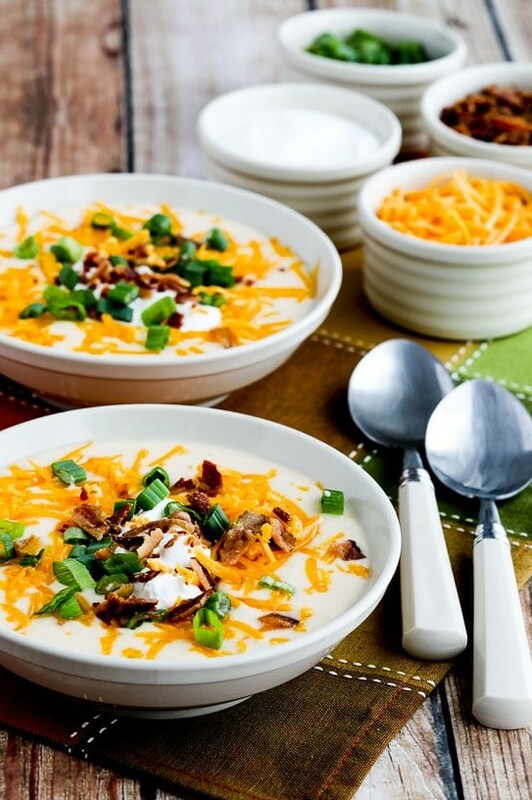 Serve hot, with grated cheese, sour cream, crumbled bacon, and green onion to add at the table. Equipment: I made this soup in my 6 quart Instant Pot but of course you can use another Electric Pressure Cooker or a stovetop pressure cooker if that’s what you have. And look at the end of the recipe if you’d prefer to just make the soup in a pan on the stove.